Battle Cry: Blood for the Blood God! Butcher them all! Pre-heresy: Arnogar Rull serves under the Worldeaters in the 24th assault company, and rose to the rank of captain. Horus Heresy: Arnogar Rull and the 24th helped out carry out atrocities throughout the Horus Heresy including the Isstvan V massacre, the purge of Nuceria and the Siege of Terra. 024.M31: When fleeing to the eye of terror, there ship the Gladius of Vengeance, was damaged by pursuing forces and the ship was lost in the warp. 080.M39: A Warp storm forms over the Segmentum Obscrus and Segmentum Pacificus boarder. Over 90 populated star systems of the Imperium are affected; the warp storm is named The Blood Veil. 088.M39: Gladius of Vengeance remerges from the warp, 8,000 years in the future. The Warband then lands Jager system which boarders the Segmentum Obscrus and Segmentum Pacificus lying within The Blood Veil. Arnogar and the survivors made planet fall on Jager Prime an Industrial world. Not expecting an attack, the forces are overwhelmed by the attackers. He then repurposes the world to build weapons and gear for the warband. 30,000 are killed and the remaining 20,000 are enslaved. 101.M39: Arnogar leads his warband to Jager II an Agri-world; He commands that the world be purge of life. 100,000 souls are hack to bits by the warband. The warband renamed themselves the Crimson Butchers. Arnogar is given the title “The Red King”. 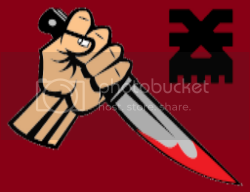 110-600.M39: The Crimson Butchers continues to raid the worlds dwell in and around The Blood Veil. Populations are either enslaved or put to the torch. 725.M39: The warband “The Rippers” challenges the Crimson Butchers for the Jager system. Arnogar Rull kills the commanding warlord in single combat after 21 hours of continuous fighting. The Rippers are absorbed into the warband. 309.M40: Arnogar Rull claims the Axe of Annihilation on the Daemon World Helcright. 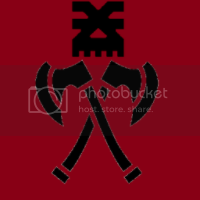 853.M40: In the neighbouring system of Demagar, A Khorne cult starts to form in the local populous. They call themselves the Blood Fiends of Demagar. 088-090.M41: The Crimson Butchers with help from daemonic forces and the Blood Fiends of Demagar, take Demagar in a 2 year long siege. 750.M41: Gul Dumir an Inquisitor of the Ordo Malleus and a task force from Astra Militarum regiment The Grey Regulars were sent out to investigate a blood cult that had been slowly expanding near the boarders of Segmentum Obscrus and Segmentum Pacificus. Gul Dumir and the Grey Regulars would find themselves caught up in The Blood Veil and stranded on an unknown desert planet. 760.M41: Gul Dumir would find a Xenos temple from what appeared to be from a long dead civilization. A spring seems to flow from within the temple, and with supplies running dangerously low, Gul Dumir drank from the spring. The spring was tainted by a heart of a long dead bloodthister. Dumir would then murder the command of the Grey Regulars and make the remaining troopers to drink from the spring, corrupting them all. 774.M41: A rescue mission was sent out to find the lost task force. The Grey Regulars rescue mission would find themselves caught off guard when they are attack by task force aided by bloodletter daemons. Gul Dumir would take over the Dauntless Class Cruiser Apocalypse Imminent force the survivors to drink from the well and rename the regiment the Bloody Greys. They would then raid the sectors and a barbarous campaign. 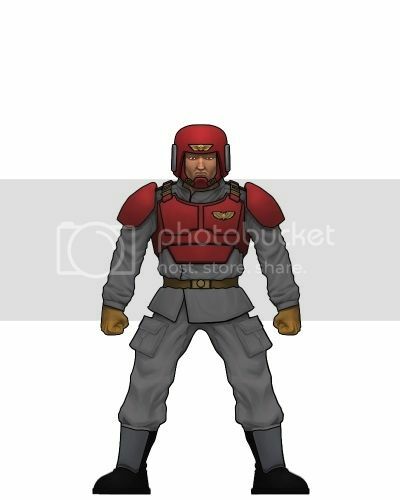 788-793.M41: Gul Dumir and his Bloody Greys enter the Jager system. The Blood Greys see the prize of Jager Prime and attack the Crimson Butchers. Both the forces are equally match and the fighting is bitter and hard for both sides. The fighting is interrupted by the arrival of a Space Hulk and Ork Warboss Togtak Helltrashah crashing into Jager Prime. Facing defeat at the hands of the orks, Gul Dumir and Arnogar Rull make peace and face the Warboss as a united front. They wipeout the orks with their combined arms. Arnogar Rull sees promise in the Blood Greys. He demands that Gul Dumir ben the knee and swear fidelity or continue to battle for Jager Prime. Gul Dumir, and his forces suffer heavy losses at the hands of the orks knowns that sees been outmatched. He bens the knee, see that it’s better to be alive and raiding than dead. 800-830.M41: With the alliance made, the warband seek out combat in the Vraks system. Gul Dumir and Arnogar Rull meet with Skulltaker warlord Zhufor. The men agree that the Crimson Butchers and the Bloody Greys will raid the trade routes and neighbouring systems in exchange for Vraksian militia men, Ogryn berserkers and the large amount of the combat drug Onslaught. During their raids, the Crimson Butchers encounter the Freeblade Autontius Titus, he is capture, torture and forces to eat the flesh of humans, and he is then possessed by a daemon and is reborn as the Hell Knight. 901.M41:The Crimson Butchers and the Iron Warriors join forces again to destroy the Slaaneshi warband Fulgrim Chosen. Arnogar Rull takes on one of Deion Thraxon’s top lieutenants Chenron Forgebreaker as Dark Mechanicus advisor. Chenron also brings with him the Obliterator cult The Gore Beasts. COMBAT DOCTRINE: The Crimson Butchers and Bloody Greys have very similar approach to warfare. Both armies use a blitzkrieg style of combat using numerous amounts of armour formations to overwhelm defenders, although both use different equipment to implement this tactic. The Butchers use Soul Grinders, Forge Fiends and Heldrakes soften the enemy while Rhino APCs to deliver Khorne Berzerkers to the front lines and engage the enemy in hand to hand combat. Arnogar Rull has been using the “Rhino rush” tactic since before the Horus Hersey. The Greys use Chimeras APCs and Vendettas to claim objects while Leman Russes and Wyverns pound any counter attack that the enemy can muster. The obliterator cult, The Gore Beasts has been known to fight for both armies. The same can be true for the Blood Fiends of Demagar, a fanatical Khorne cult that is used mostly as cannon fodder and recruitment. During the siege of Vraks, Arnogar Rull acquired large amounts of the combat drug Onslaught. The combat drug is mostly used by members of the Blood Fiends but has been used forcible on enslaved ogryns to make ogryn berserkers to great effect. 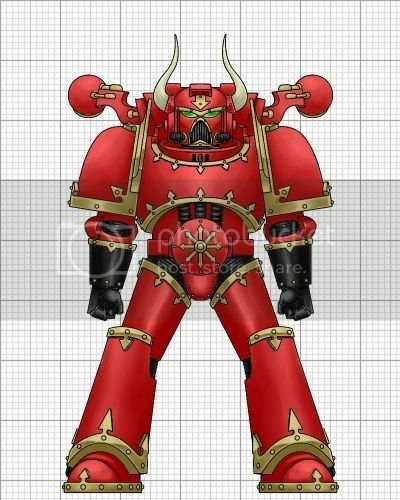 In larger conflicts both The Crimson Butchers and The Bloody Grey have super heavy armour at their disposal with a Lord of Skulls, The freeblade knight The Hell Knight and Shadow Swords in there armouries. ORGANIZATION:The Crimson Butchers, similar to other Khorne Daemonkin warbands, have a patron Kraagarr Gorehowler a Bloodthister of the sixth order. It is uncertain how long Gorehowler has been influencing Arnogar and the Crimson Butchers. Gorehowler has claim responsibility for bring the Gladius of Vengeance back into real space, although some claim that it was his influences that originally cause the ship to be lost. The Crimson Butchers are a collection of the original Worldeater 24th members and other smaller warbands in which they have either conquered or invited in. The requirements are simple to join the warband, you must worship Khorne (either directly or not) and pledge fealty to Arnogar Rull. In the Crimson Butchers weapons and supplies going to the strongest members and the lower ranking members picking up the scraps left behind. Challenges to authority are made via a ritual hand to hand combat to the death. This ritual combat is done with no weapons or armour. Each participant chooses a Blood Guard, a witness to the ritual to ensure that the fight is fair. Anyone can make a challenge to anyone else and the victor gains the loser equipment and titles. The Bloody Greys on the other hand still follow a standard chain of command with Gul Dumir as the commander. Members are a mix of the fallen Grey Regulars and Vraksian militia men as well as rouge pirates that have fallen to chaos. Equipment is handed out to the squad leader who distributes the gear to his guardsmen. Disobedience is usually handle by Gul Dumir himself or the commanding officer of that unit. No one dares challenge Dumir because of the backing of Arnogar Rull and the Crimson Butchers. The relationship between Arnogar and Dumir is one built as mutual dependence; both need other in different ways. Arnogar relies on Dumir for intelligence. Arnogar was a man lost for 8000 years and the galaxy has changed a lot since then. As a former agent of the Ordo Malleus, he has the intelligence to aid Arnogar in this new galaxy. Dumir needs Arnogar, not only because Arnogar and his Crimson Butchers are a superior fighting force but the fact that Arnogar gives Gul Dumir reign legitimacy. Without the alliance between the two warbands Gul Dumir command would most likely be challenged. The lost to take Jager Prime is more than enough case to dethrone Dumir. It’s the fact that Arnogar props up Dumir and Arnogar finds Dumir useful is how the relationship works. Some of the more glaring differences between the Crimson Butchers and the Bloody Greys are the use of psykers. The Bloody Grey employs psykers known as Daemon Mages. These are psykers that specifically specialized in the summoning of daemons. As the Greys operate more and more outside the Blood Veil and warp storm activity, they have recruited more and more of these types of psykers. The Crimson Butchers in opposing belief do not employ psykers at all and will sometimes activity hunt psykers in Khorne’s name. They are more reliant on their patron’s power and warp storm activity to bring daemons to the battle. The Daemon Mages and Arnogar more or less tolerated each other. Does this relate to the models you were working on way back when? They do. I'm retaking all the photos, so expect an update on that thread soonish. Also I have planned some homegrown rules for some of the characters as well. An interesting read, and I look forward to more. I find it interesting that your guardsmen's scheme are pretty much the same as mine, except that I swapped the red and the grey around. Maybe I should try doing a similar write up for my Guard/Marine/AdMech force, considering that fluffwise I have them all come from the same system. Plot Synopsis: Avenging Lions (Dark angels Successor Chapter) task force is sent to investigate the remote promethium refinery to figure out why they aren't producing. When the taskforce enters the refinery they are attack by Bloody Greys Infantry. The task force defeats the traitor guard force but the Bloody Greys detonate promethium field. The massive explosion kills most of the taskforce; the only survivors are Librarian Leonaras Giencus and 4 tactical marines. The survivors must make their way to the space port to contact there ship. Along the way the group is attack by Orgyn Berserkers, the group takes casualties but defeats the Orgyns until Arnogar Rull shows up. Arnogar and Leonaras battle but Leonaras dies at the hands of Rull. Plot synopsis: : Roxanna Ironheart of the Order of the Martyr’s Rose is captured by Bloody Greys and brought on board the ship the Apocalypse Imminent. Gul Dumir tortures Roxanna in order to break her and give up the location of her comrades.